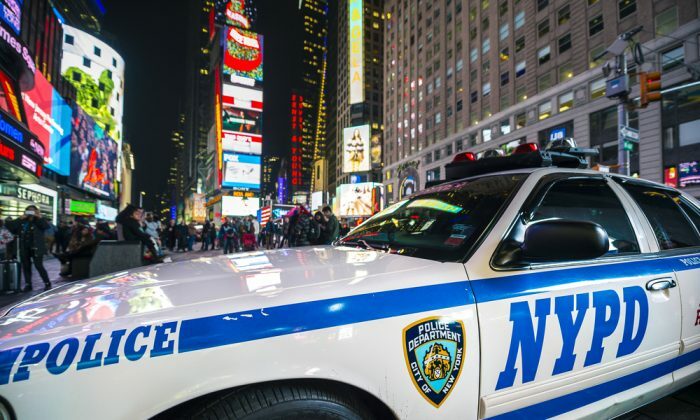 A police officer was struck and dragged by a car spinning its wheels so fast that the tyres were smoking, shocking footage captured in Times Square shows. The black Mercedes-Benz C63 whipped through West 43rd Street at around 11:45 p.m. Saturday night, Jan. 13, and stopped in front of the military recruiting station, where an NYPD officer outstretched his arms in an attempt to halt the wild driver. Instead of complying, the driver swerved and tried to flee the scene, while the officer bravely kept his hands on the hood of the car. But the driver suddenly accelerated and threw the officer onto his knees in the middle of the busy intersection. The officer quickly picked himself up and shouted, “Get that car!” and he chased the motorist down the street with another officer, their guns drawn. The car made its escape via 42nd Street. The brave police officer, identified as 26-year-old Ian Wallace, was rushed to Mt. Sinai St. Luke’s hospital with minor injuries to his back, arms, right leg, and right hip authorities said, according to the New York Post. “The police officer could have gotten really hurt,” Victoria Soloviev, a tourist who witnessed the scene, told CBS. Speaking to NBC, Freddie Kim, who operates an outdoor souvenir stand in Times Square, also described the scene as “crazy.” He added that it’s not the first time he’s seen people drive wildly and burn rubber in Times Square. “Down here? He must be crazy to do that,” tour vendor Barry Abdourahamane said to CBS. Food truck operator Ray Cortes said the NYPD officer should get a pay raise for his brave actions, according to CBS. The investigation is ongoing and no one has been arrested, according to reports. The NYPD is on the lookout for a black four-door Mercedes sedan.